- Suitable to be used for keeping documents, papers, etc. Different designs and colors available. Traditional portfolio with soft leather exterior lets you write in style. This practical design offers two full panel pockets to organize your important correspondence on the left and a slot to hold a notepad. Also featured a pen loop. This is cover bag. And this is made by screwpain leafs , this is poure organic nd totaly hand made handicraft products. best useful save and safety documentry carry with journey any where you are go. 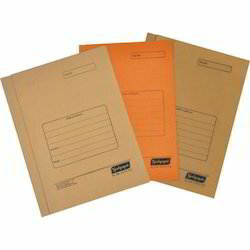 Our range of stationery items include zari file folders that are used to keep files and documents. These are manufactured by using high grade raw material which ensures a long service life. One can keep A4 size papers in the file. 4 different pockets are given inside the file where one can store papers and a plastic clip is given to file important papers. We are among the reputed organizations, highly engaged in offering optimum quality 4 Flap Cloth. - Ideal for Training, Reference Manuals, Project Reports, Office Papers, Proposals etc.